Hey everyone! 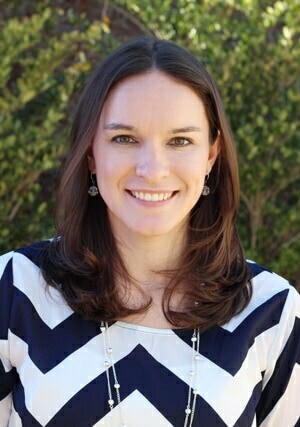 I’m Lindsay from Life, Love and Sugar, where I share all kinds of fun and tasty treats and desserts. 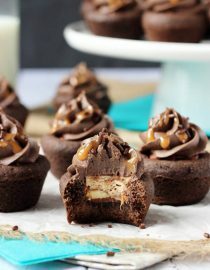 I’m so excited to be guest posting today and sharing my Snickers Chocolate Cookie Cups recipe. I love making easy everyday treats, as well as more elaborate desserts like a fun cake. 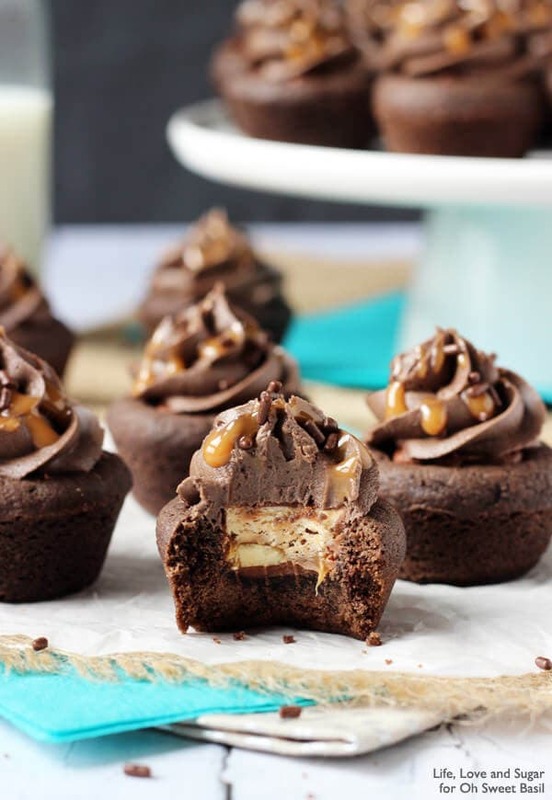 And taking a fun cookie up a notch with these Snickers Chocolate Cookie Cups is right up my alley! An easy to make, over the top cookie that uses simple ingredients! Growing up, I didn’t actually like Snickers. How crazy is that? Fortunately I came to my senses and now it’s one of my favorite things to bake with. 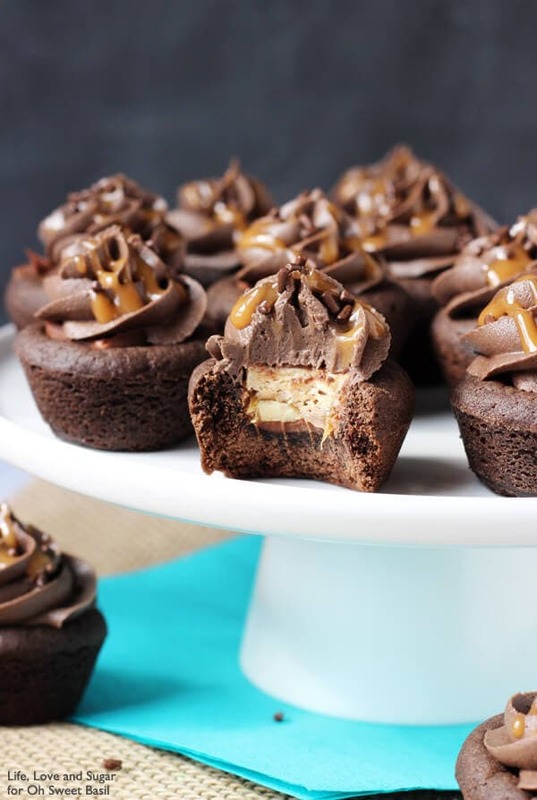 Can’t beat chocolate, peanut butter and caramel! The chocolate cookie used in this recipe is one of my favorites. Soft and chewy without being undercooked. And the dough is so easy to mix together. Once you’ve got the dough made, you bake it in a mini cupcake tin to make the cookie cups. 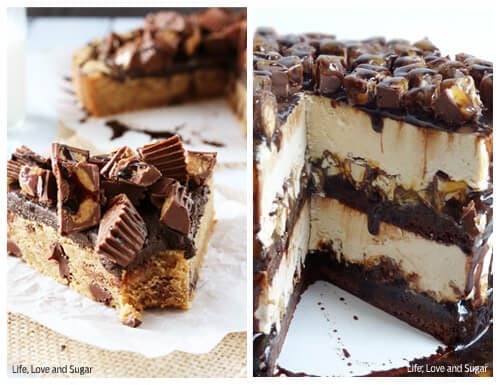 After they come out of the oven, add the mini Snickers. 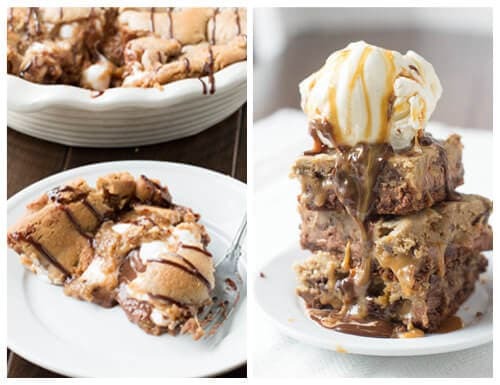 They’ll melt right into the cookie – gooey and delicious! Once they’re cool, you’ll want to make the icing. It’s a light chocolate icing with a little bit of peanut butter added. 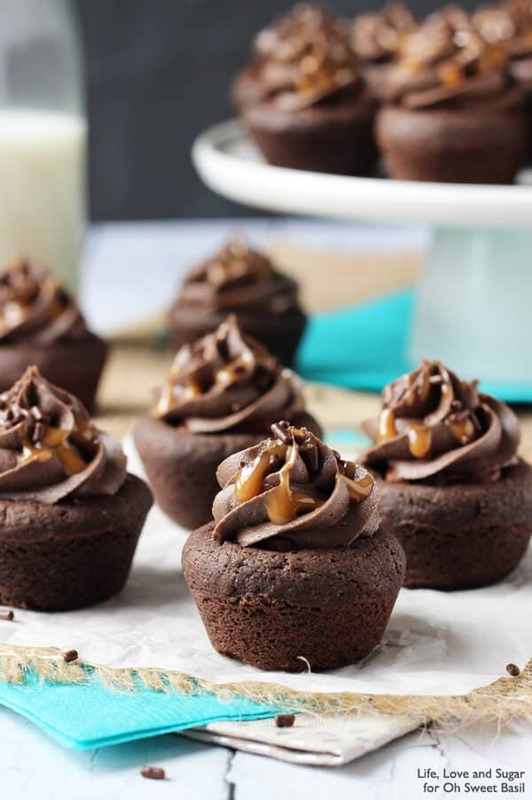 Top the icing with a little caramel sauce and you have the perfect little cookie cup. FULL of flavor! Thanks so much for having me today. I hope you enjoy the cookie cups! What is the Difference Between Bakers Chocolate and Cocoa? Cocoa powder generally contains just 10 to 12% cocoa butter, while pure unsweetened chocolate contains about 55%. You can substitute cocoa for bakers chocolate if you add 1 tablespoon butter, shortening or oil for every 3 Tablespoons of cocoa. 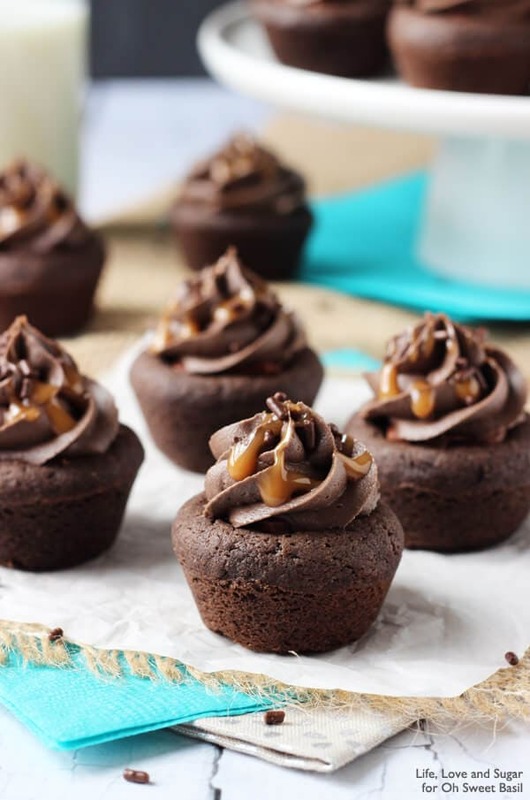 Can Cupcakes be Baked Without the Paper Liners? You can bake cupcakes and muffins with using the paper liners. Just be sure to use nonstick spray in the pans and let the cupcakes cool before removing them from the pan. How Long Will Cupcakes Keep? Unfrosted cupcakes last for up to six months in the freezer. Cupcakes will keep for a week in the refrigerator. 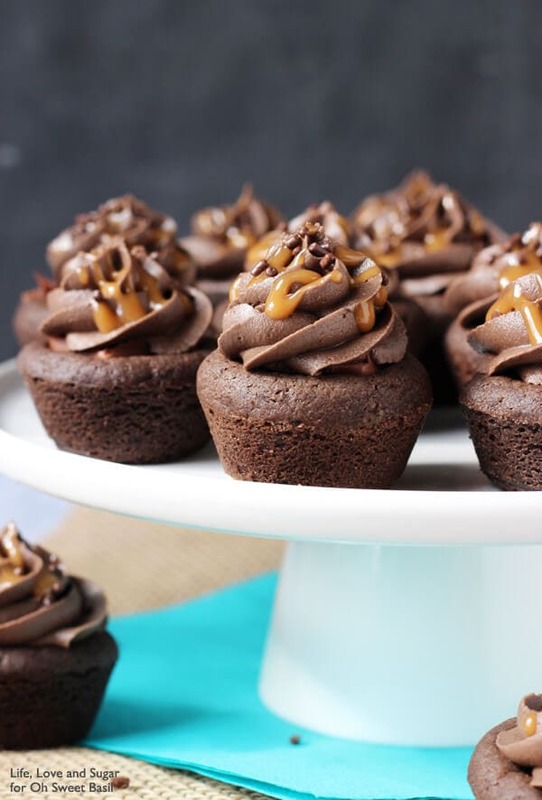 You can keep cup cakes for 2-3 days at room temperature. Make balls of about 2 large tsp in size and press into the bottom of each mini muffin cup. Press the center down just a bit to make an indention, where you’ll add the mini snickers later. You want each cup to only be about 3/4 full. Looking for more tempting recipes?